School buses are the safest vehicles on the road, with their highly visible standardized color, safety-minded compartmentalized seating, and front end stop arms to communicate to nearby drivers that the vehicle is coming to a stop and students will be unloading. 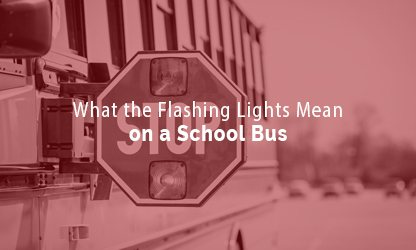 The amber colored, red and flashing lights of a school bus are also very important safety features, meant to communicate what’s happening or what may happen next. Although the lights have been used in most school districts for decades, motorists on the road may need a reminder about what the lights mean and what they should do. Here’s a quick refresh on what you need to know. Simply put, the sheer size of a school bus tends to limit visibility for both drivers and Students. Since the students, and especially younger children, may not know street-crossing laws and consequences, it helps to stop traffic so they can get on or off the bus safely. In the mid-1940s, most states in the U.S. created traffic laws that required drivers to stop for school buses when children were loading and unloading. By the 1970s, all states implemented a standard school bus traffic stop law. These can vary by state in terms of when to stop and how far back to stop, so it’s important for motorists to know their specific state laws. YELLOW: When amber lights begin flashing, it means the school bus is slowing down and preparing to stop. This is particularly important in areas with higher speed limits so drivers can slow down before the lights turn red. In general, motorists behind a school bus should slow down and not attempt to pass the bus, and oncoming cars should slow down and proceed with caution if still passing. Some states, such as South Dakota, require drivers to slow down, possibly even to specific speed limits such as 20 miles per hour or less. A few states, such as South Carolina, don’t allow passing at all. RED: When red lights begin flashing, it means the school bus has stopped and students are boarding or leaving the bus, so all motorists should come to a stop, whether behind the school bus or oncoming. It is illegal to pass a school bus from behind, and oncoming drivers must stop at least 15-20 feet from the pathway where students might walk. Special Note: In many states, this doesn’t apply to oncoming drivers on streets with two or more lanes in each direction because school buses aren’t allowed to let passengers on or off the bus in situations where they must cross multiple lanes of traffic. STOP ARM: The extended arm pops out when the flashing red lights turn on, which is another visual indicator for motorists to stop and wait for pedestrians. Vehicles must stop until the arm is retracted. The front end stop arm also serves as a reminder to students of the safe distance recommended to cross in front of he bus in order to help them remain visible to the bus driver. ROOF STROBES: These flashing lights on top of the bus are typically white or amber and flash during inclement weather or low light to get drivers’ attention. The laws for these lights vary by state, as well. In California, for instance, roof strobes are used during fog, rain, snow, smoke or dust but not the low light that occurs before sunrise or after sunset. On the other hand, Michigan allows use of strobes during inclement weather, loading or unloading of passengers, and during times of low bus visibility such as at dusk and dawn. Although studies show that traffic accidents have declined since yellow lights, red lights, stop arms and strobe lights have been installed on school buses, they still occur. That’s why motorists may be ticketed and fined for illegally passing stopped school buses. Motorists may also receive demerit points on their driver’s license or license suspension, depending on the state and severity of violation. In some states, a police officer must witness the violation, while in other states, a school bus driver can report the violation. As technology improves, many states have installed cameras on their school buses that can detect and automatically report vehicles that pass a bus. To avoid any concerns, drivers should research their state laws and be prepared to stop when they see flashing lights on a school bus. To learn what SafeStop is doing to help keep school buses and passengers safe, talk to our team or request a demo.